411 Regency ~ Perfect Condo ~ Perfect Beach!! Don't delay ~ Book today! Unit 411 is 'Simply The Best' that Navarre Beach has to offer! I have 6 beautiful 2 bedroom units at the Regency - so bring the family and friends! I also have a beautiful 3 bedroom, 3 bath unit with summer openings! Love to send you information and pictures of 507 Regency. Weeks are Sat. to Sat. during summer season! 411 Regency is professionally furnished with new furnishings throughout. Casual elegance with everything you need to have a perfect vacation! You will love the one-of-a-kind teak root dining table! It is a platinum status condo and will exceed your expectations. The Regency has the largest 2 bdrm, 2 bath units on Navarre Beach with the only private (15 x 8) balcony on Navarre Beach! High Def TV's in every room. Enjoy free Wi Fi in the unit and a well equipped Fitness Center on the first floor. Navarre Beach is simply stunning with beautiful sand and water during every season! Our condo will have everything you need to enjoy your time at the beach! We have 3 units on the 4th floor and 2 on the 5th floor ~ one is even a 3 bedroom unit! Bring the family!! Navarre's fishing pier is the longest one in Florida and they are catching fish every day! If you are not a fisherman just enjoy the walk and view the marine life from the pier! Great Marine Science Center on the island! We invite you to spend your vacation time with us in our beautiful 4th floor condo at the Regency! We are located on the West side of the complex which is also the pool side of the resort. You can sit on the 30 x 8 private balcony and enjoy the beauty of the beach and all the fun going on in the pool! Great for those that want to watch the kids without getting wet and we are far enough away to skip the noise! Our condo, our resort, and our island are 'Simply The Best'! Come and enjoy everything we have to offer from our fitness center to our heated pool (March through October). If you have never been to Navarre Beach and your idea of a vacation is unsurpassed beauty, peace and quiet, pristine white sand and emerald water.....that describes Navarre Beach! Just sun, sand and surf ~ come relax with us ~ island style! IF YOU HAVE FAMILY AND FRIENDS COMING WE HAVE 2 UNITS ON THE 4TH FLOOR AND ANOTHER ON THE 5TH FLOOR!! Navarre Beach is one of Florida's best kept secrets. Our beach is family oriented, quiet, peaceful - spectacular beauty without the crowds to spoil it! Come and enjoy some 'down time' with us. Remember - our Regency units are not the typical rental units and Navarre Beach is certainly not the typical crowded beach in the Florida Panhandle. 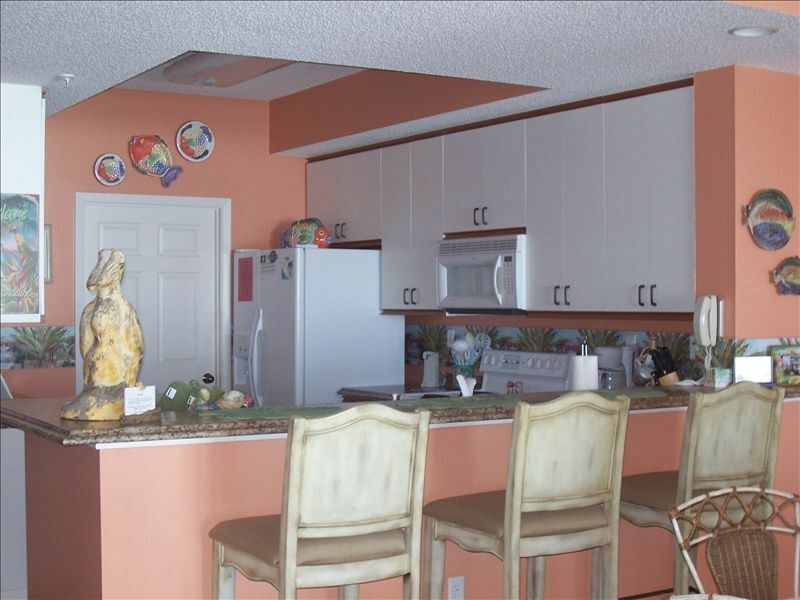 Our condo has been professionally decorated and fully appointed. You will find everything you need at your fingertips. 411 Regency is located on the west side of the complex convenient to the pool and beach walkover - which by the way has NO steps! If you have children or older guests this unit is on the west half or pool side of the resort and most convenient to the beach and pool. All Regency balconies are Gulf front - large, private and spacious and we have comfortably furnished unit 411's balcony. It has a dining table, 4 chairs, 2 chaise lounge chairs and a glider. The unit boasts nine foot ceilings, crown molding, and doors opening from both the living space and master bedroom onto the Gulf front balcony. The large master bedroom suite has a king-size bed and a whirlpool tub in the private bath. It is very upscale and tropical in décor. The second bedroom has two queen-size beds, TV and DVD. The living area has leather reclining sofa and love seat with High Def Smart TV and DVD player. The condo comfortably sleeps eight. The view from the living space and master bedroom is simply breathtaking! While sitting on our private 30x8 balcony you will enjoy everything you'd expect - dolphin jumping, surfers, fishermen, and sandcastle builders - and of course don't forget the fabulous sunsets! This is the perfect place to start or end your day! The kitchen has ample cabinets and you will feel as if you are cooking at home - everything you need if you choose to cook. However if that's not on your 'to do' list while vacationing we have great restaurants within walking distance. You will have a microwave, icemaker, coffee maker, blender, washer, dryer, and dishwasher for your use. Our condo is our second home - and is furnished as such - it is not the typical rental unit. If excellence is expected in your everyday life then don't settle for less while on vacation. Call us, better yet, come for a visit! You will not be dissappointed when staying with Simply The Best! Our unit is a Non-Smoking, No Pet Condo. Minimum rental age is 25. Check in after 3:00 pm CST and Check out is before 10:00 am CST. If you have questions or if our calendar for 411 is filled feel free to email or call me. We have 2 units on the 4th floor and 3 units on the 5th floor ~ so bring your friends and family. I love to talk about Navarre Beach and all that it has to offer...and all of our beautiful Gulf front units. Come and enjoy island living at its best! Keywords: Large 2 Bedroom, 2 Bath Condo with spectacular views! Ron and I just celebrated our 46th Anniversary! We are the proud grandparents of twin boys, Luke and Andrew, who have just turned 8 and a beautiful granddaughter, Ellie, just a week old at this time! We have had so much fun with the twins during their trips to Navarre Beach and can't wait to introduce Ellie to Navarre Beach! Great family memories created! The beach is the perfect place to spend relaxing with our family and friends and it brings peace to our souls! We always wanted to have a place on the beach and Navarre seemed to have just what we were looking for - beautiful sand, water and lots of peace and quiet! Feel in love with the location of this unit, close enough to enjoy the beauty of the pool but far enough away to enjoy the quiet too! You will enjoy the family atmosphere of our resort and our condo. We love to have families join us and share their beach experiences with us. The perfect place to relax and enjoy all that the beach and your vacation time has to offer. Large private balconies, large pool, new fitness center - lots to be enjoyed! Sits right on the beach! Wonderful views! Sits right on the Gulf of Mexico - nothing between you and the beach! The condo is beautiful and stocked with everything you need and then some. Being able to walk right out to the beach was perfect. The beach was amazing. We also enjoyed the pool on a day that was windy and didn't want to be in the blowing sand. The view from the balcony was wonderful. We would definitely stay here again. Just a short drive across the bridge to stores or restaurants. Just returned from out five night stay at this wonderful condo. It was all we expected+. The size of the condo was larger than other 2 bedrooms we have stayed in the past and the kitchen had every pot, plate, glass, and utensil you could ask for. Beds were comfortable and the unit was very clean. Was a bit further away from Pensacola Beach than I expected but the drive was manageable. We were there for business mixed with some pleasure but plan to return in 2019 for strictly a beach vacation. Also, great experience with booking and owner. So glad you had a good trip!!! We really try to equip the condo with all the comforts of home! Unfortunately the beach road was closed due to Hurricane Michael or your commute to Pensacola would have been much shorter. Love to have you return anytime! Thank you so much for the review! We also feel Navarre Beach is a 10 plus! Glad you enjoyed the condo and the complex! This unit is the most well-equipped we have ever stayed at. She has everything you could ever need in the way of towels, etc. and especially the kitchen equipment. She even had a potato masher. No one ever has a potato masher in their vacation condo. I could go on and on about the view, the size of the unit, the comfort of the mattresses, etc. Nice, large flat screen tvs and cable in the living room and both bedrooms. That is something too many owners overlook. I can't tell you how many units I have seen with old tube tvs still in the bedrooms. We will definitely try to rent this unit again. So glad you enjoyed the condo and had everything you needed! I really want our unit to become your "home away from home"! Come back soon! Beautiful condo, location excellent. Most wonderful beaches ever. Our whole family loved it. Would rent this condo again. Betty you have done a beautiful job on making people feel at home. All very excellent!! Thanks for the kind words! We really want our guests to feel that our condo is their "home away from home"! Always like to hear that those visiting Navarre Beach love it as much as we do!